Recently I was invited to test drive the 2016 Mazda 3 for a week. I'm a big fan of smaller cars because of the gas savings. I firmly believe that you don't need a mini-van or SUV to have enough space for a family of four. But it can get tricky when your husband is over six feet tall to find space for his legs and a person in the back seat. 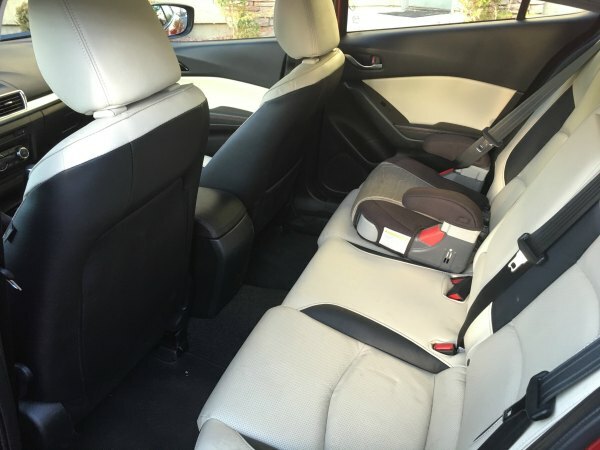 I'm happy to report that my family loved the 2016 Mazda 3. The kids were sad to see it go at the end of our week. My kids are 7 and 9. The 7 year old is still in a booster seat and the 9 year old is the size of a 12 year old. There was plenty of room in the back for both of them even when my husband was in the car with the front seat all the way back to accommodate his long legs. The arm rest in the middle folded down and had cupholders for the kids, which is always a plus for road trips! I love having a little separation to cut back on the nitpicking. 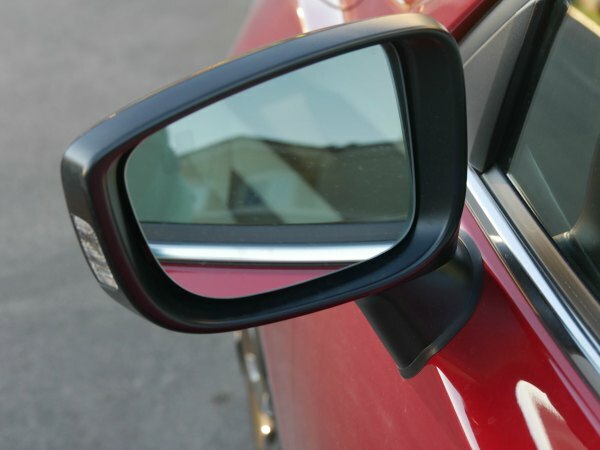 My absolute favorite feature of the Mazda 3 was the blind spot sensor. You can barely see the little shadow in the top left corner of the side view mirrors. Whenever a car is in the blind spot, orange lights appear in that corner. If I had my signal on and a car was in the blind spot on that same side, the car beeped to let me know there was a car. I'm on the shorter side and it's hard to turn my head back to glance in my blind spot so these sensors were so helpful. 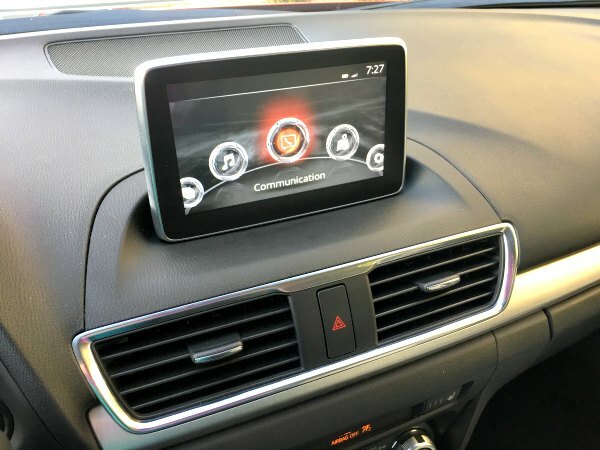 The Mazda 3 is equipped with a lot of fun extras. I found the screen on the dash to be very convenient for finding gas stations, directions, music and even a rear camera. Hello, parallel parking made easy! Good trunk space is absolutely vital for a family car. The Mazda 3 did not disappoint in this area. It is a hatchback with plenty of room for groceries, sports gear, school gear and more. We never had an issue with space in the trunk. 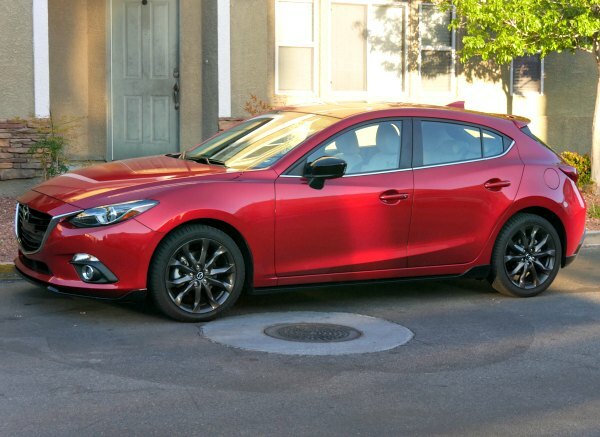 The 2016 Mazda 3 is a sporty little car. One of my favorite features of the car was the “Sport” mode when I was able to zoom-zoom with the best of them. The Mazda was super fun to drive especially in sport mode! If you are in need of a family car but hate to give up that sporty feel, then the 2016 Mazda 3 is definitely a car worth looking at. Thank you to Mazda and Drive Shop for letting our family zoom-zoom for a week! 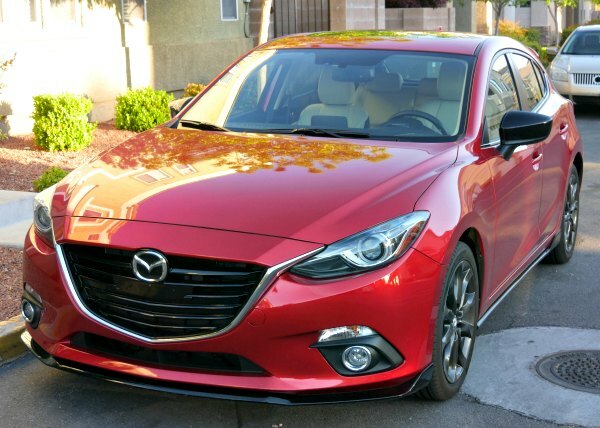 I have a 2014 Mazda 3 (but the sedan model) and really enjoy driving it. 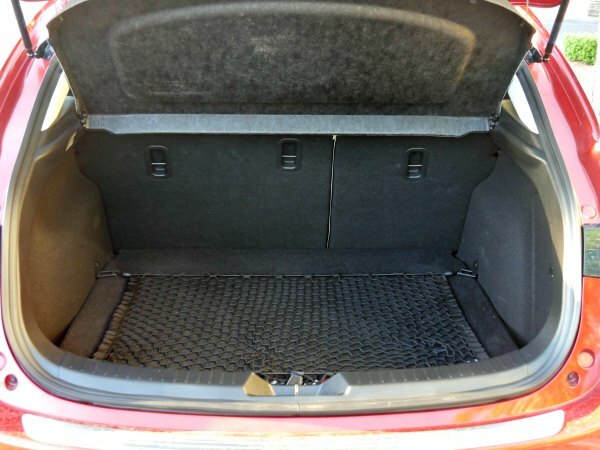 I agree that it’s very spacious in the back, and even after putting my golf bag in the trunk I have plenty of more space for bags, groceries etc. (and junk!). We easily fit our two girls and their car seats in the back, but it gets crowded when we try to bring our two dogs somewhere as well. The blind spot sensor is very handy, but dangerous if you have another car that doesn’t have it 🙂 I’ve gotten so used to it and sometimes I forget that my girlfriend’s car doesn’t have it when I drive hers, which can be a bit startling. Yes! Switching back to my car without the blind spot sensor was very hard. I got used to that handy tool.